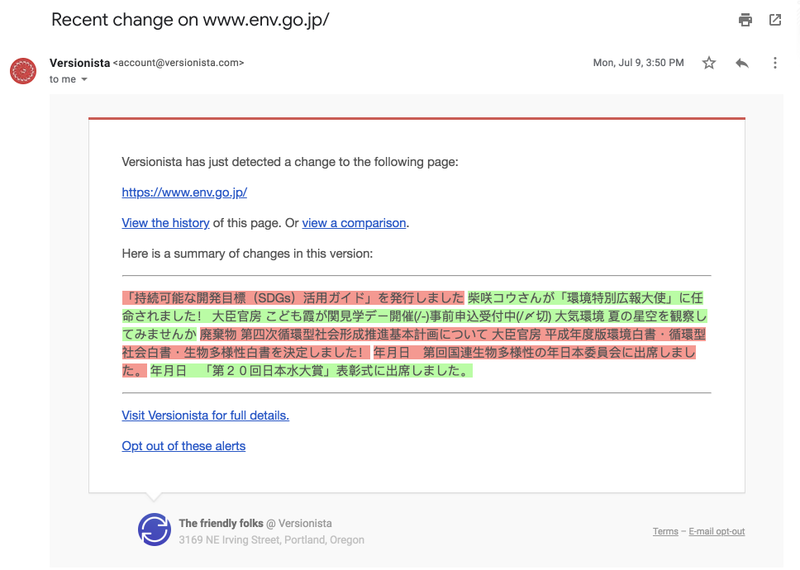 Versionista provides a robust platform to monitor websites for key changes. Our goal is to deliver timely, accurate, and comprehensive change reports. With these change summaries, our customers have actionable insights to better optimize their businesses. Add a top-level page and we will monitor that page for changes. We'll also harvest all links. 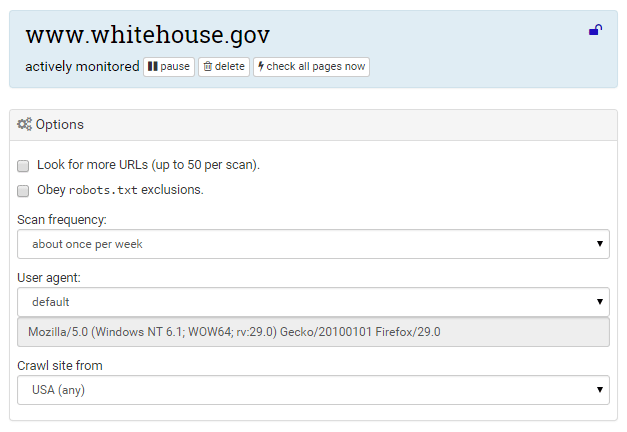 With a click, you can turn on monitoring for those pages, too. 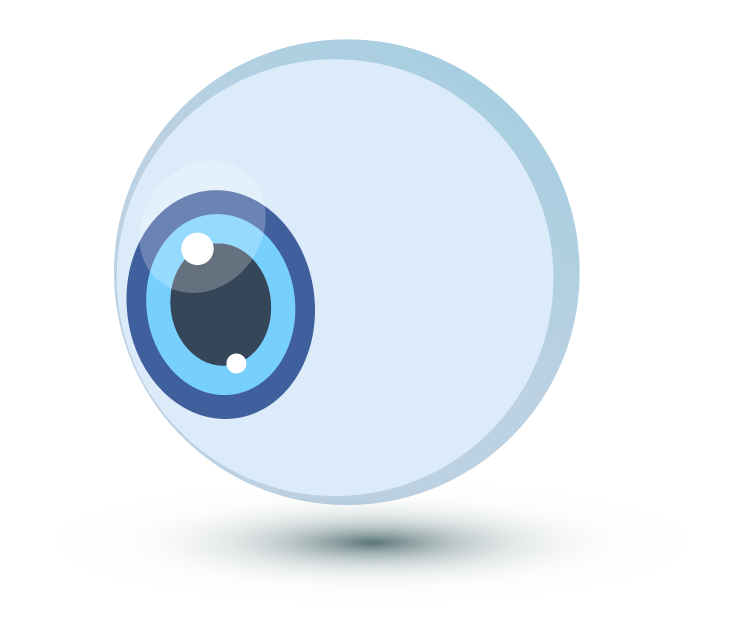 We monitor individual pages, but also entire sites. 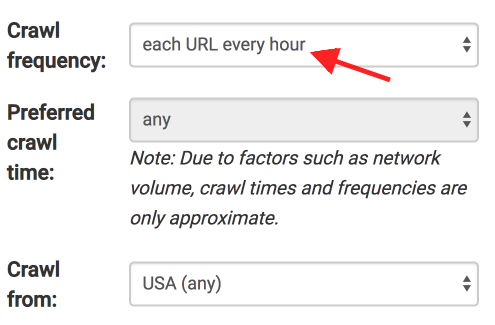 We give you fine-grained control over link harvesting and monitoring. Fully automate new page discovery, or rely on your team to manually fine tune. We'll algorithmically determine the best time to crawl. But you can also fully configure when and how we crawl. We will send you detailed reports highlighting all changes. 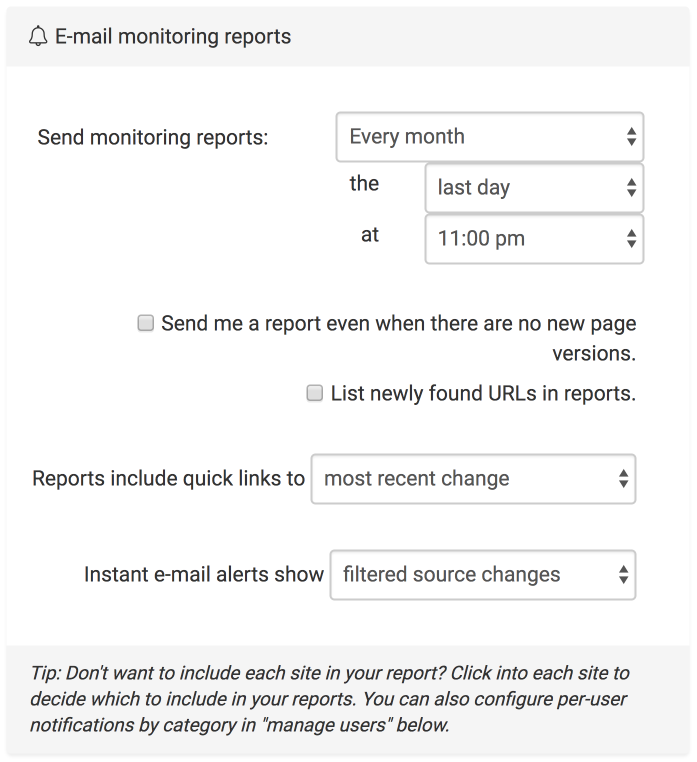 As with everything in Versionista, we offer a ton of ways to configure the e-mail reports and alerts. 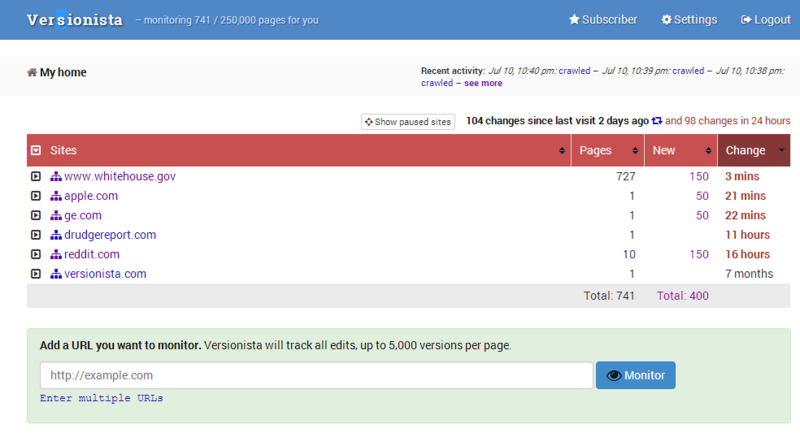 After you've added some sites or pages to monitor, your dashboard will list all sites in order of most recent edits. 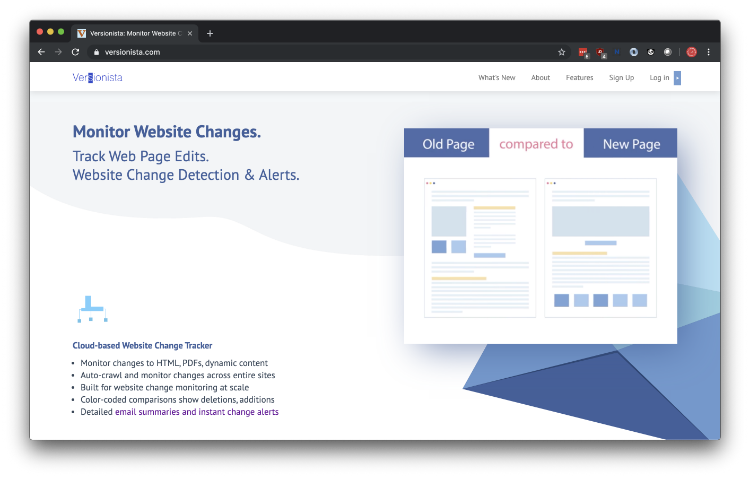 You can expand each site to view a partial list of pages with recent changes. This is a quick way to jump straight to the comparison viewer to see the changes. When you click into a site from the dashboard, we present a lot more data. 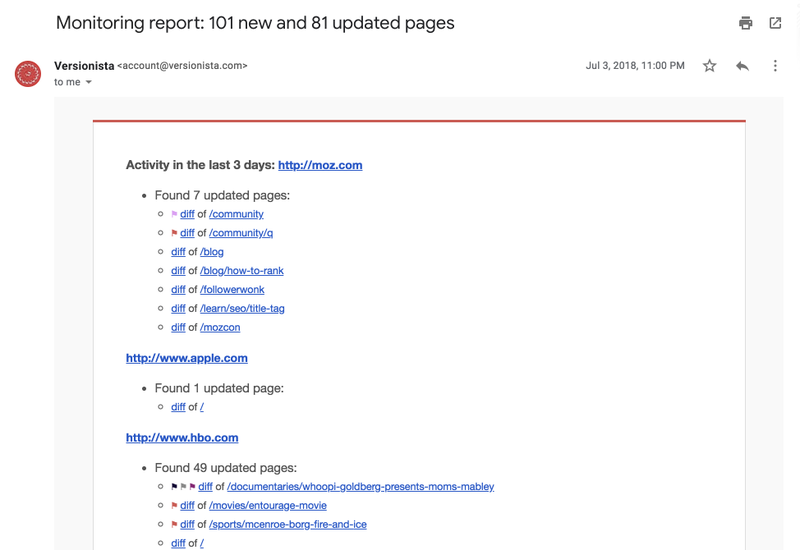 Here we highlight newly found pages which you can choose to ignore or monitor. You can also edit the speed at which we crawl the site. With Versionista, you control your own spider. How frequently should we spider? And do you want to crawl from a US IP address? Or Europe? Maybe Asia? And what user-agent (browser) do you want to use? Customers use Versionista for all sorts of reasons, and we recognize the value of providing all sorts of crawling options. 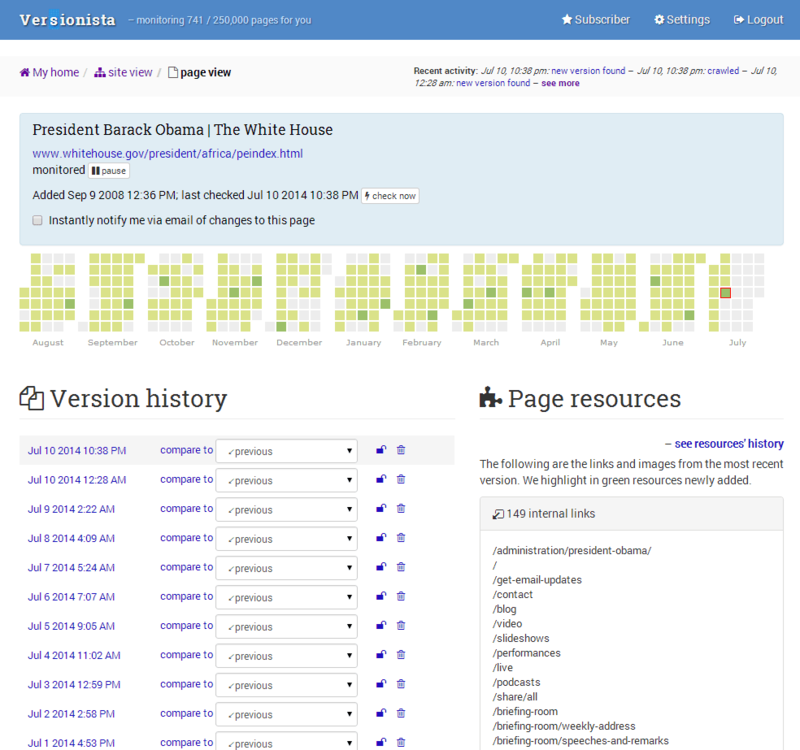 Many teams use Versionista to track corporate assets, government sites, and other content. 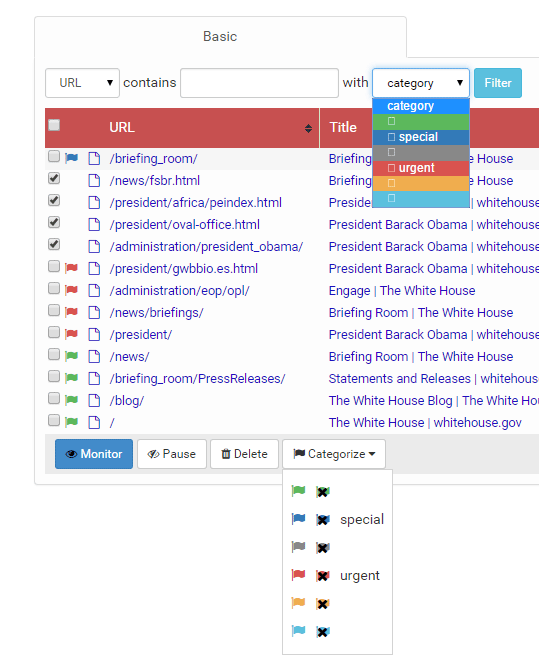 We allow for quick categorization of monitored pages, simplifying workflow, particularly for teams. Categories are fully configurable in account Settings. Click into a specific page and you have a lot of detail on the monitored page. We include a chart atop the page which shows you every day that we found a change. We include a list of every version we've found. From this, you can quickly jump into the comparison viewer to see the actual changes. To the right of the page, we include a list of "page resources." This shows you all internal and external links, images, css, and js files. 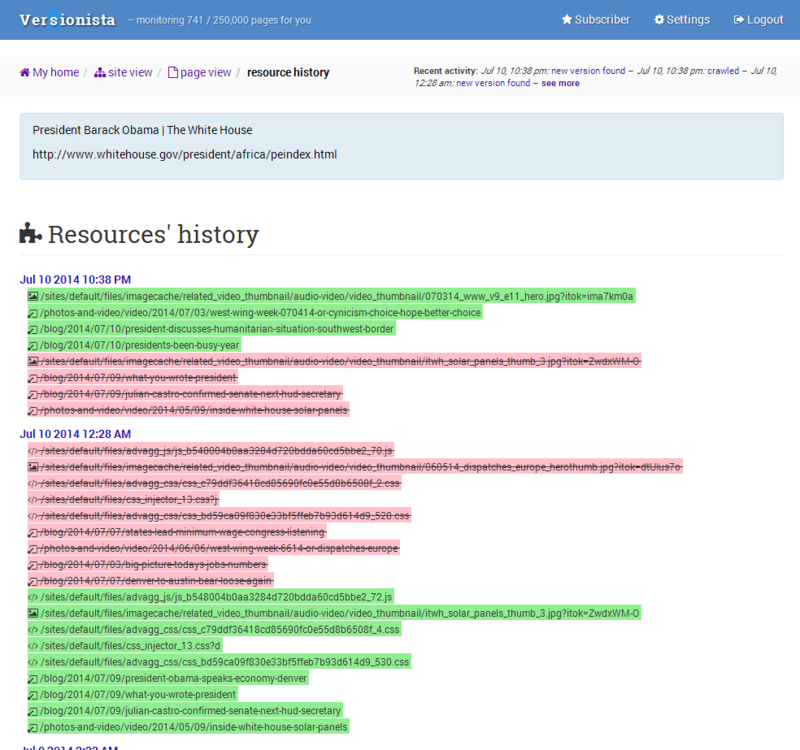 We highlight in green any of these resources newly added since the last version. This is an outstanding way to track how these assets are being used. From the "page view," you can click into a "resource history" for that specific page. 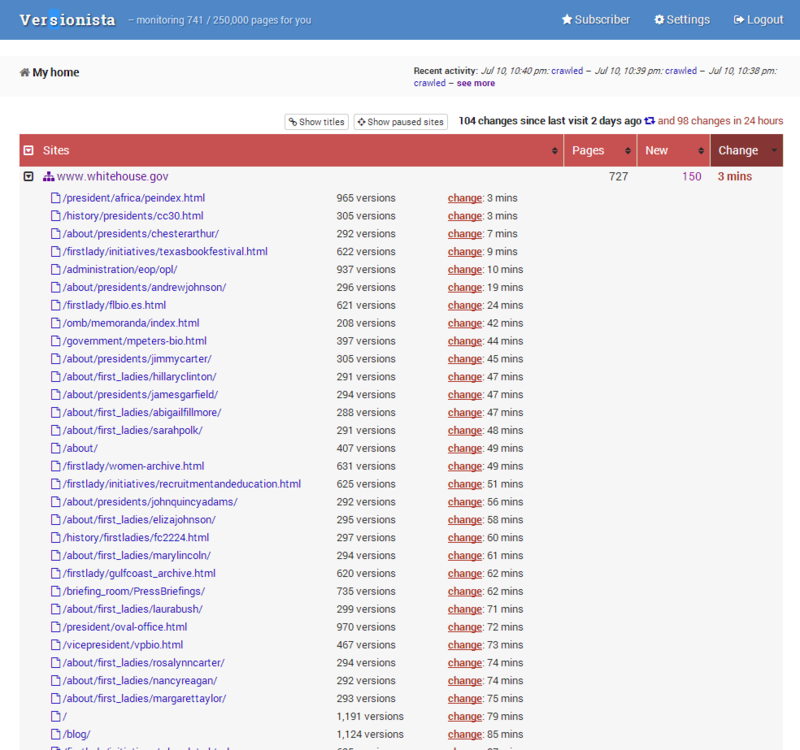 This will highlight all new and deleted links, images, css files, and js files for each version. 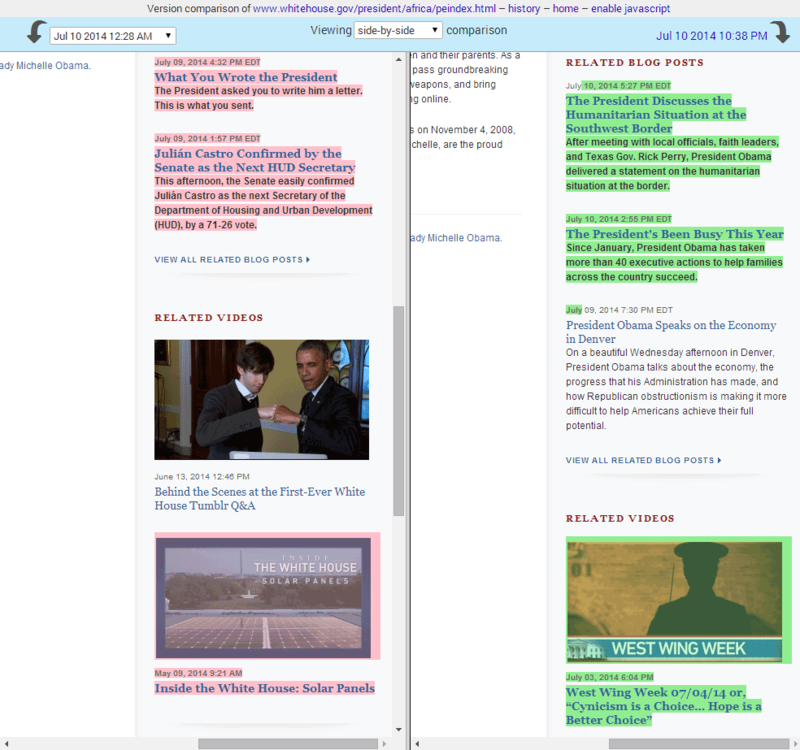 There are many ways to access the "comparison viewer." This shows you a side-by-side comparison of each version. We highlight in red text (and images) that were deleted from one version. And we highlight in green those newly added. There are several different ways to view the differences. After all, some differences are subtle, and may require digging into the actual HTML. 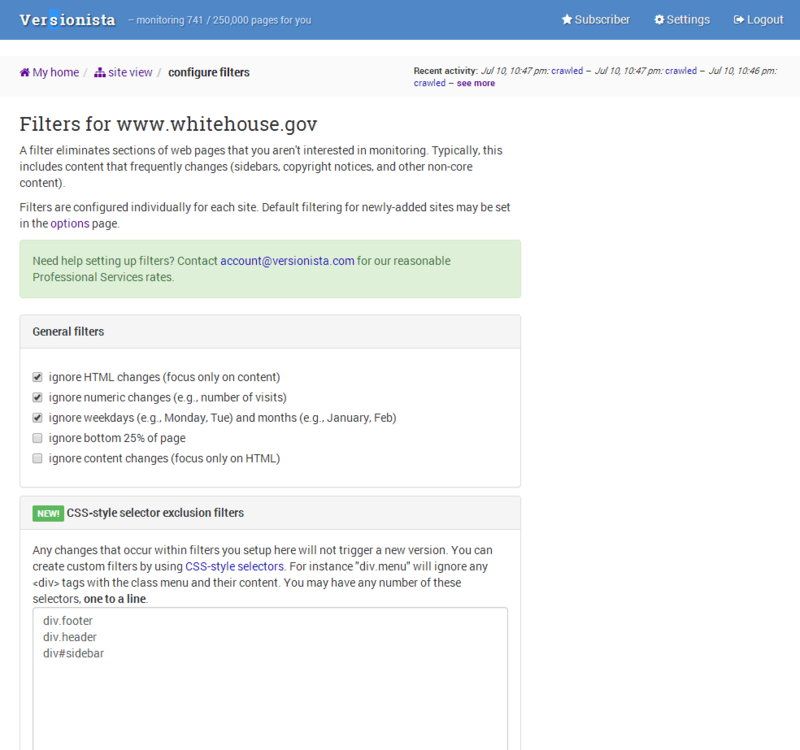 From the "site view" page, you can click into "filters" to setup all sorts of methods to ignore certain changes. For example, maybe you aren't interested in any changes in the header, footer, or sidebar. By identifying those areas via CSS selectors, you can tell Versionista to ignore changes there. We also provide Regular Expression filters, "inclusion" filters (only focus on specific areas), URL filters (only find URLs that match certain strings), and more. Learn more about Versionista filters.